Lily of the Valley Bulbs or ‘Pips’ are available for sale both as dormant bulbs and potted plants. More of a rhizome than an actual bulb, they are available online from from autumn through to mid winter, ready for planting immediately. 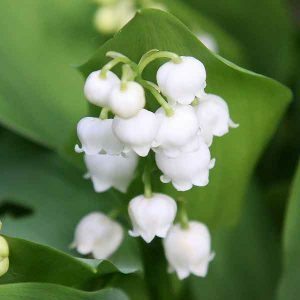 If you are looking for fragrance in spring, then Lily of the Valley are the bulbs for you. The rhizomes are sometimes referred to as ‘pips’, the flowers are a favourite in wedding bouquets. Also used as cut flowers and for use in floral arrangements. The broad lance shaped green foliage provided a perfect foil for the white bell shaped flowers. Sometimes seem as fussy plants, we find Lily of the Valley easy to grow and in fact a very hardy plant given a little care when planting. Basic Lily of the Valley Care is simple – cool damp and light shade. Although we must say they will grow well in morning sun as well. Excellent beneath deciduous trees and also just near the drip line of shade loving camellias and other shrubs. They are also suited to growing in pots for those who wish to grow them in courtyards. Plant will reach a height of around 15cm and will spread by underground runners in good conditions. Fragrant with attractive green foliage this is also a favorite in Bridal bouquets. Convallaria majalis ‘Flora Pleno’ is doble flowering form (twice as many petals). Convallaria majalis variegata is a form with variegated leaves, strong thin cream to yellow stripes on green foliage. Convallaria majalis ‘Essies Giant’ is a large flowered form of Lily of the Valley..
Convallaria majalis ‘Fortin’s Giant’ similar to and maybe the same as the above. Cost of the plants varies depending on the variety, as a rule the common form will cost around $2 a pip. The rarer forms $6 and upwards. 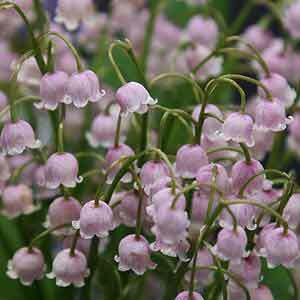 Lily of the Valley bulbs are available for sale online from the following participating nurseries.